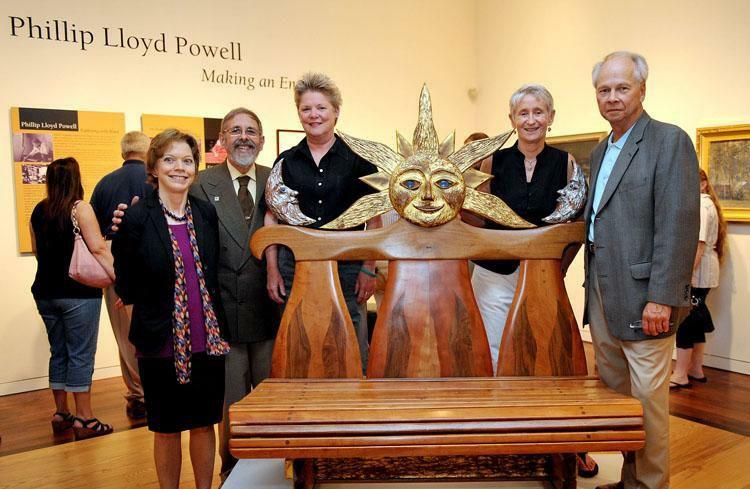 Doylestown, PA – Friends, family members and fans of one of New Hope’s finest craftsmen, the late Phillip Lloyd Powell, shared stories and remembrances of his life at The James A. Michener Art Museum Sept. 24, during a private ceremony to unveil a hand-carved wood door and surround, installed at the entrance to the Museum’s Martin Wing. The reception, part of a preview to two new exhibitions, LitGraphic: The World of the Graphic Novel, and Bucks County and the Philadelphia Sketch Club, celebrated the life and creativity of Powell, who began crafting furniture as a teenager and operated a showroom on New Hope’s Mechanic Street beginning in the 1950s. “He was one of New Hope’s sparks of creativity,” said Michener Director and CEO Bruce Katsiff, who had been a friend of Powell and remembered him riding his bicycle through New Hope. “He would travel for three months at a time,” recalled Abraham Leibson, who once accompanied Powell to India, and to a school in Darjeeling that educated children of illiterate parents. Powell was a supporter of that school. Herb Spiegel, a professor of marketing at Mercer County Community College, remembered Powell riding his bicycle up to the Rosemont Café for breakfast when he was well into his 80s. “I couldn’t argue that,” said Mr. Spiegel. Dorsey Reading, who met Powell in 1956, talked about collaborating with Powell on a psychedelic fun house for Atlantic City. Mr. Reading also collaborated with New Hope craftsman Paul Evans, and is working with Michener Curator Connie Kimmerle on a Paul Evans show, slated for fall 2012, that will include some work by Powell. Powell created the door for the Craftsman 67 exhibition at the Philadelphia Civic Center and later installed it at his New Hope residence on Route 202. Because it was not a commissioned piece, it represented his true spirit, said Ms. Kimmerle. When the building was demolished the door was saved and eventually offered for public auction. The Michener Art Museum acquired Powell’s elaborately carved and painted pine door through a Rago Auction in 2009. Over a period of six months, furniture conservator Behrooz Salimnejad undertook a cross-sectional microscopic analysis of the door’s paint layers while stabilizing the door and repairing areas that were damaged by insects and moisture. It had been covered over with two coats of latex, but family members recalled the original red and orange colors it has been restored to. Funders Sharon B. and Sydney F. Martin were the first to walk through the door at the end of the ceremony, when Mr. Katsiff announced a long-term loan of a Phill Powell bench to New Hope Borough for its new Borough Hall, slated to open to the public this fall. With a sun face at the center flanked by two crescent moons, the bench has flames of a darker wood against a lighter-colored wood. Powell (1919-2008), whose designs blur the line between sculpture and furniture, created work for collectors as varied as Lenox China and writer Paddy Chayefsky. He was inspired by George Nakashima and Wharton Esherick. Sharing studio space with fellow New Hope artisan Paul Evans, Powell began incorporating metal and found objects into his own work. Powell traveled extensively to Spain, Portugal, England, Sicily and Morocco, where he was inspired by the carvings and decorative elements found in furnishings and architectural elements. The Museum’s Hankin Gallery displays a walnut fireplace surround, a prime example of Powell’s sophisticated deep-carved work that follows the sinuous wood grain and highlights the irregularities of the wood.